Reverse Peripheral Neuropathy Damage NOW - Begin With A Neuropathy Severity Evaluation For $47. REVERSE PERIPHERAL NEUROPATHY DAMAGE – READ ON AND FIND OUT HOW! Peripheral neuropathy is a progressive disease of the nerve endings most often occurring in people 50 years old and over. Progressive nerve deterioration eventually leads to symptoms including numbness, loss of balance, tingling, pins and needles, burning sensations, and eventually unrelenting pain. These symptoms get worse over a period of months to years and are different for every person. Over time, as the nerves get worse, the nerves of the hands can also become involved leading to problems with dropping objects, alteration of handwriting, numbness, tingling, and eventually chronic pain. This progressive nerve disease is often caused by chronic diabetes (even if well managed), chemotherapy, vitamin imbalances, side effects from medications, chronic inflammation, and spinal stenosis. All of these factors can damage the delicate blood vessels that are responsible for feeding your nerves and keeping them healthy. Medical help often begins and ends with a symptom cover-up approach. Medications like Gabapentin, Lyrica & Neurontin (if they work at all) cover-up pain but do not stop or reverse nerve damage. Antidepressants like Cymbalta may help one tolerate symptoms, but again, do not address the underlying condition…progressive nerve deterioration. If medications DO NOT WORK, what about surgery or physical therapy? Unfortunately, there isn’t a surgery to address this progressive nerve damage and physical therapy doesn’t work either. Now exercise (physical therapy) may help with balance but it cannot stop or reverse the nerve damage. If it could then walking around would do the trick. Plus, why work on balance training when the nerve damage is still present and is going to keep getting worse. Let’s not put the cart before the horse. In order to effectively treat your neuropathy three factors must be determined. 2) How much nerve damage has been sustained. *** Once you have sustained 85% nerve loss, there is likely nothing that we can do for you. To heal damaged nerves, we use our State of the Art Multi-Spectrum Laser (MSL) . This laser is not like any other Laser you may have already seen or heard about. Why? Because those other Lasers were not designed specifically for neuropathy and typically produce only one or two small beams of Laser. While that may be good for pinpointing a very specific spot like a cavity in a tooth, it is not good for healing a large area of damage like a foot, a leg or a hand with neuropathy. That’s why we use our Multi-Spectrum Laser (MSL). This Laser was designed specifically to treat neuropathy and uses 120 separate beams that surround your damaged body part and saturate your dying nerves with the blood, oxygen and nutrients they need to heal throughout the entire treatment session. Our laser even stimulates the growth of new blood vessels around the damaged nerves to better provide them with the proper nutrients to heal and repair. It’s like adding sunlight, water and Miracle Grow to a plant and seeing the roots grow deeper and deeper. Laser treatments alone may not be enough to heal some advanced types of neuropathy. 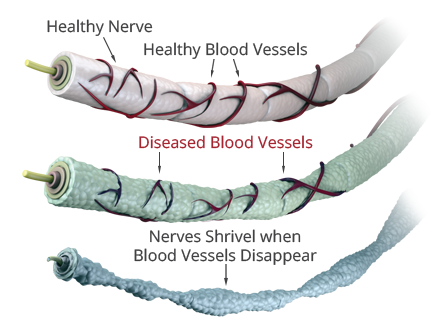 This is why we also use Deep Nerve Stimulation (DNP) to heal neuropathy. DEEP NERVE STIMULATION: WHAT IS IT? With Deep Nerve Stimulation (DNS) we send a specific, pulsing wavelength of stimulation that penetrates deep down to where the damaged nerves are. The DNS treatment jump starts your damaged nerves. DNS retrains those sick nerves to transmit healthy signals instead of the bad, damaged neuropathy signals they are sending now. The number of treatments needed to allow the nerves to fully recover varies from person to person and can only be determined after a detailed neurological and vascular evaluation. As long as you have not sustained at least 85% nerve damage there is hope! Nerve damage of 85% or beyond means we cannot help and will not accept the case. “I can sleep better, walk better and have much better balance. The thing I love about this program is they aren’t pushing pills at me. I’m very pleased with my progress and strongly recommend this program.” – Barbara H.
“I first noticed the tingling and numbness about eight years ago. Then my feet started to hurt and they always felt like they were swollen. My doctor put me on Gabapentin, Lyrica and then Cymbalta. Nothing worked and it was getting harder and harder to walk. We had to cancel a family vacation because of it. Three weeks into this treatment and my pain level was less than half of what it used to be. A few weeks later, I barely had any more pain, the numbness and tingling went away and I have much better balance. I’m very pleased.” – Charles S.
“I tried everything. My doctor had me on multiple drugs and they not only didn’t help my neuropathy, they made me dizzy, tired, made my heart race and left me with dry mouth. I wanted something that would actually work and without all the side effects. This program has been wonderful. I’ve had about 80% improvement. It’s been great!” - James W.
"My doctor told me nothing would help the pain in my feet and I'd just have to live with it. I knew there had to be something out there that could help. Thank you Dr. Rappaport for taking the pain away!" - Howard S.
The more people we treat, the more I see that this is the answer people with neuropathy have been waiting for. So now is the time to call us at 561-369-0808 to schedule your consultation. Our office is called BODYWORKS WELLNESS. We are located at 7410 Boynton Beach Blvd (in the Flakowitz Shopping Center). Our phone number is 561-369-0808. Call Today for an appointment. We can help you.